The “painstaking attention” that Gucci claims “pours”1 into its Made to Measure service certainly never overflows to fill any Gucci fragrance bottles. Many companies, naming a new perfume after an exclusive and extremely expensive experience, would use that opportunity to make a costly fragrance, full of top-quality ingredients. 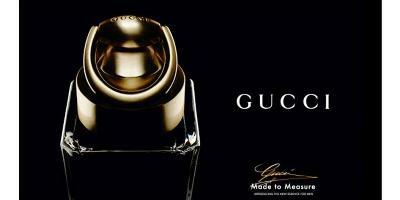 Gucci Made to Measure Eau de Toilette is available in 50 ml ($68) and 90 ml ($88). 1. Via the Gucci website. 2. Made to Measure includes fragrance notes of bergamot, orange blossom, lavender, aniseed, nutmeg, water lily, juniper berry, plum, cinnamon, cistus labdanum, patchouli, leather and amber. 3. Of course, there are other, more positive, takes on Made to Measure; just look how British GQ reviews a major advertiser’s product! Made to Measure was two mehs and a blah to me. Too bad. So incredibly boring, so blah…’Made to Pass on By’ imo. Omega: no doubt it will still rake in the dough. Tell us how you really feel… just playing, great and honest review. Kevin: I always do! HA! White onion? Not even Demeter-worthy. Yikes. Galbanumgal: yes, a onion-y tang…watery and faint…but detectable on me…but fleeting too. The SAs at both Saks and Nordies were pushing this vile juice. Hated sampling it on paper and then when I actually tried it on my skin I immediately scrubbed it. And yet overripe fruit can be a great note if handled well (Diorella, Calyx). I guess there is a very fine line between overripe and rotting fruit. Annemarie: true enough…overripe can be on the verge of intoxicating…”rot”…nauseating! The note I’m talking about in Made to Measure is really neither…too dinky to matter. I have nothing to say about the scent — I haven’t tried it and probably won’t, now — but as for why baby llama, well, it’s the softest, isn’t it? Baby llama usually comes from young animals, and is usually from the first shearing of any given animal, but not always: the term really just refers to the fineness of the individual fibres (about a half to a tenth the thickness of a human hair). R, just did some reading…seems BABY is a classification…not related to the age of the llama…hope the shearing is gentle. You give it way too much credit. Some of my absolute all time favorites – Envy, Rush, and the dry dry dry GPH – are Gucci, but the last interesting thing they did was Gucci Pour Homme II. Everything since then is as you say – completely forgettable and nondescript. Yes i agree, this stuff is really bad. Gucci really doesnt have any good mens fragrances available right now. Have we come to expect anything more from Gucci?